Foreign exchange rates in emerging markets have suffered significant damage against US dollar, including Asia’s high-growth economies (India, Indonesia, Philippines). Is the severity of the damage justified? Internationally, US dollar has been fueled by the Federal Reserve’s rate hikes, oil price increases, and the Trump administration’s trade wars. Domestically, the worst foreign-exchange performers have been emerging economies - including Argentina, Turkey, Brazil, and Russia - that are vulnerable to rate normalization, exposed to Trump tariffs, major energy importers, or whose sovereign interests have conflicted with US geopolitics. While some of these external and internal conditions also apply to emerging Asian economies - India, Indonesia, and Philippines - their strong fundamentals would not seem to warrant so severe penalties (Figure). So why are they falling? Note: The bars reflect year-to-date percent change in each currency against the US dollar; emerging Asian currencies are in red color. Why is the Philippine peso falling? The Philippine economy is projected to grow at an annual rate of about 6.8% in 2018 and 2019, when it could become an upper-middle income economy. Yet, recently, the Philippine peso sank to a 2005-low of 54.28 per US dollar. The Duterte government is pushing an extensive infrastructure program, which requires foreign imports that in the long-term will raise living standards. In this regard, the peso’s depreciation was to be expected; it is a temporary sacrifice for investment into the future. 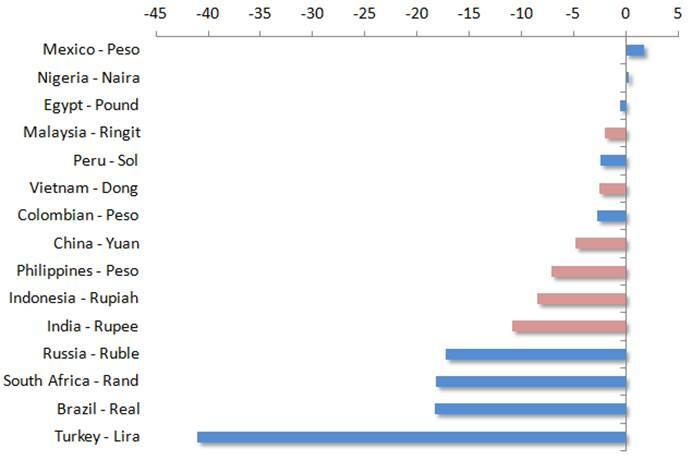 In January, when the peso was still 50.80 against the US dollar, I projected the peso to soften to 54 or more toward the end of the year, which I considered largely the net effect of normalization in advanced economies (especially the US Fed), elevated trade friction worldwide, and the infrastructure drive in the Philippines. As imports of capital goods continue to flood in to support Duterte’s infrastructure drive, the trade deficit may widen further. Some Western analysts take this to mean gloom and doom for the peso. Yet, their predictions ignore seasonal variation and thus the impending remittance effect. Since 2009, the highest monthly remittances value has occurred in every December and last year’s $2.7 billion inflow in the month was the largest in record. These funds have historically alleviated pressure on the peso. Nevertheless, along with other currencies in emerging Asia, Philippine peso is not immune to pressures in the coming years. Why is Indonesian rupee falling? At the end of the summer, Indonesia’s short-term projections could still rely on consumption to offset soft trade. In the second quarter, expansion amounted to 5.3% year-to-year; the fastest since the last quarter of 2014. Indeed, in Indonesia, the first half of the current year indicated an upside momentum. In part, that reflected the rise of government spending ahead of the 2019 elections, which supports improved private consumption. And yet, Indonesian financial markets continue to feel the pressure from the emerging markets’ end-of-summer sell-off, despite relatively benign domestic conditions and strong future potential. In late July, Indonesian rupiah was still below 14,400 against US dollar; today, it is over 14,800. Understandably, policymakers have used interventions to cushion the rupiah’s decline and avoid volatility, while seeking to reduce the current account deficit. Moreover, fuel price liberalization is on hold. However, as seen from Jakarta, the extent of the sell-off has not been justified by Indonesia’s fundamentals or external balances. Nevertheless, policymakers will have to cope with pressure, which is not likely to diminish in the immediate future. Why is Indian rupee falling? Today, India is among the largest economies in the world. In the recent quarter, it posted impressive growth of 8.2%. And yet, contagion worries from the US-Turkey friction were a mounting concern in India through the summer. Recently, rupee reached an all time high of 72.70 against the US dollar. It has lost more than 13% against the greenback year to date and is likely to face more downside pressure in the months ahead. External balances continue to suffer from pressure, as trade deficits have surged and current account gap may widen to -2.7% of GDP (more than 50% increase from FY2018). As the central bank seeks to defend the currency, foreign reserves have declined. While the fall of the rupee leaves analysts apprehensive, Finance Minister Arun Jaitley is pushing India to reduce “non-essential imports” to enable foreign investors to buy rupee bonds issued by Indian companies. Still, the sharp fall in the rupee is stoking inflation as imported goods become less affordable. In the short term, inflationary threats have eased but oil remains a risk in inflationary projections since India is a major energy importer. In all three economies, there are some internal factors (e.g., rising inflation, current account deficit, delayed infrastructure projects, etc), which explain part of the story; but in no case do they account for the full story. The conventional explanation is that the emerging markets adjustment reflects the strength of US economy and US dollar as safe haven. It was not a bad explanation in the postwar era when the US still fueled the global economy. But today, the US accounts for only a fifth of the world economy. It has suffered from trade deficits since the ‘70s. The debt burden exceeds 106% of US GDP. While the US was long an energy importer, commodities are still denominated in US dollars. The euro is strong internationally; the Chinese yuan is ascendant. So the conventional explanation is defunct. The presumed strength of the US dollar no longer relies on its fundamentals, but on a perception that such fundamentals prevail, despite dramatic changes. Whether it is a question of the debt burden, budget deficit or current account deficit, in most cases, US economy is actually relatively weaker than the three Asian economies. Intriguingly, the recent emerging-market currency selloff was focused against the US dollar. The same outcomes were smaller or tiny in terms of trade-weighted real effective exchange rate (REER): Indian rupee less than -4%, Indonesian rupiah less than -2% and Philippine peso less than -1%. In brief, these currencies may succumb to US dollar, but not against each other. Most of the adjustment is cancelled out in real effective terms. No informed investor would stake all portfolio funds on a single stock. Yet, that’s what foreign-exchange markets currently do. The net effect is a house of mirrors. In the 21st century, the world economy desperately needs a multipolar basket of major currencies. Business as usual today is likely to result in a dollar crisis tomorrow.